The connected home is coming, but right now it’s a disjointed experience where getting something to turn on or interact with other connected devices requires an app or a hack. Want to turn on your Hue lights? There’s an app for that. Unfortunately, it’s a different one from the app that opens your connected door locks. This needs to change, and that change is coming. There are a plethora of projects from SmartThings to Mobiplug to IFTTT to help bring your disparate connected devices together into one user interface. And now there’s WigWag. This Kickstarter project (from an Austin, Texas based company) looks like a heap of fun, allowing you to create the same types of recipes that users of IFTTT will be familiar with. The project offers a relay, which is essentially a wireless hub that can speak Wi-Fi and the X10 home automation gear standard. There’s also a sensor that can detect a wide variety of inputs from temperature, ambient light, humidity, motion and more. The other component is an output of LED lights in a 2.5-meter strip. The idea is that when the sensor detects physical changes it can tell the relay to perform a web-based action, such as sending a text or an email or it turning the lights on or off. And of course, there’s a cloud-based service that supports it all. The application also works with other connected devices inside the home so you can use other gadgets such as the Hue light bulbs or the Belkin WeMo as both inputs and outputs. As someone who can spend a few hours playing around with different IFTTT recipes a few connected gadgets, this type of project seems like a wonderful toy that will cost about $119 for the smallest package to $579 for a whole-home package. I’m not sure if this is the right model for the connected home for most people, since building out recipes might be daunting for some people, but it might help consumer companies understand how to build connected ecosystems inside the home. In a podcast with Carla Diana a few weeks ago we discussed how these “maverick” platforms like the Twine sensor and SmartHubs home sensor pack are allowing early adopters to play, but such open-ended options might not be right for the average user. Platforms like IFTTT that help tie the physical and virtual world together via easy to compose recipes might be a nice bridge. 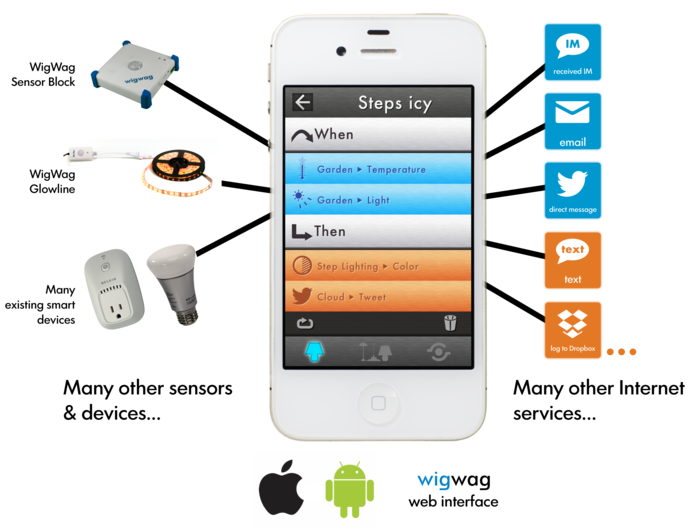 What’s fun about WigWag is that it is providing both a “maverick” platform with its sensor and relay box, but is also allowing users a more intuitive control panel a la IFTTT. I bought into to Kickstarter today for this … But I’m also curious to know for sure it will work with X10, and could it be integrated into Indigo for Mac (which I currently use for my X10 stuff). It’s might be that consumer disconnect point you were mentioning, just far away enough into programming that a lower level geek like myself won’t be able to leverage the system that much… But it will be a fun toy regardless. Thanks for the piece. The “maverick” platform approach is interesting… I’ve got a couple of Hue bulbs I can use with this. Thanks for highlighting. Great thoughts. But we’ve been promised a “connected” home since at least the 1960s (and remember in the 90s when everyone was wiring their houses with Cat5?). What makes this current crop think they can succeed where two generations of great minds have already failed? This is really clearly written/explained. Thanks for the great coverage on this. Glad I can help. Thanks for reading.